A new book by Swiss author Guido Lengwiler arrived in the fall of 2013, and SGIA is excited to share some excerpts with readers. Entitled 'A History of Screen Printing - How an Art Evolved into an Industry', the book chronicles the rapid advancements in the ancient art of stenciling that took place during the late 1800s, and how it turned into screen printing as we know it today. With help from the families of the pioneers, industry supporters and over 15 years of research, Lengwiler has rescued an almost lost history that covers the period up to and including WWII. It tells the interconnected stories of how a relatively small group of people, many of them artists, signwriters and entrepreneurs working in the dawn of the advertising age in the US, helped create entire industries that continue to exist globally today, all using screen printing in the production of an unbelievably wide range of products. It includes beautiful full color illustrations from the Selectasine Booklet provided to original patent licensees, and the main vehicle that spread the process around the world. Hundreds of never-before-seen product photos, machine designs and some of the first art prints done in the 1920s in California are included, plus special chapters on fine art printmaking, along with the ceramic and textile industries. Screen printing was a hybrid process that provided both graphic and manufacturing advantages over other methods, and was perfect for the times. Industry, especially in the US, was transitioning from hand craft into mass production, creating a need to decorate products, or advertise them with signage. Most times a closely guarded industrial secret, screen printing bridged gaps between hand production and the more expensive automated printing of the time, which included lithography and letterpress. It introduced cheap short-run color capabilities, and virtually created the whole point-of-purchase (POP) and specialty advertising industries, along with the billboard and T-shirt printing sectors. An ability to print directly on a wide variety of materials led to the decoration of metal, ceramics, textiles and plastics, spurring record growth, better designs, and lowered costs in any industry that adopted it, from fashion to fine china. Experiments prior to WWII led to printed circuits, which in turn revolutionized the electronics industries. All of these, and more, are legacies of the pioneers of screen printing featured in the book. The history of the process is really the history of so many things we take for granted in today's - and tomorrow's - society. "Guido Lengwiler has written the first truly comprehensive and deeply researched history of screen printing, beginning with late 19th-century precursors and extending through the years of World War II," commented Richard S. Field, Curator Emeritus of Prints, Drawings, and Photographs at the Yale University Art Gallery. "Anyone who but skims through these pages will gasp at the heretofore unimagined visual resources that have been gathered to substantiate the text - hundreds of images that had all but disappeared from the public record. 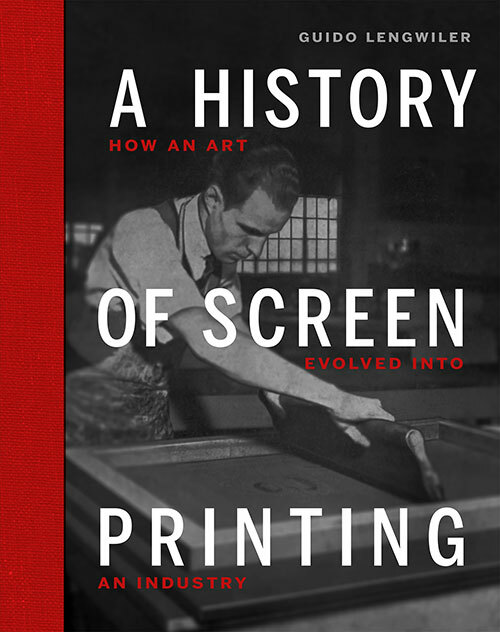 This book is testimony not only to Lengwiler's dogged pursuit of history, but also to his immense success at unearthing the families and archives of those who were screen printing's pioneers." Following are excerpts from the new book. Open stencils were used for decorating walls, furniture, textiles and other everyday objects into the 20th century.? In both Europe and America, churches and public buildings, as well as upper middle class homes, were decorated using stencils, usually in bold colors. This was the simplest method for creating colorful ornamentation or other repeating patterns in rooms or stairwells. House painters and ornamental painters both used this technique. In many cases, a selection of prefabricated stencils was available from which the client could choose the desired pattern. Sometimes stencil techniques would be combined with painting as well. 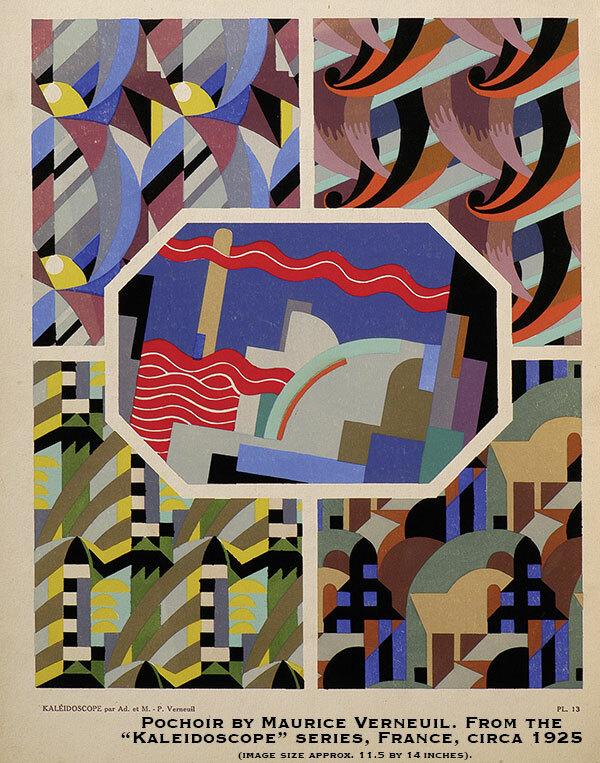 Printed matter in Europe and Asia was also largely colored by means of stencils leading up to the 20th century. First, the outline of a motif was printed in a single color (in woodcut technique, for example) and the other colors were stenciled on afterward. Stencil coloring required less technical effort than multicolored woodcut printing, and was more economical than hand coloring.? In medieval Europe, colored playing cards were among the first types of popular printed material to be produced in large runs. In the 19th century, stencil coloring was used mainly to produce illustrated broadsheets in France and Germany. These depicted subjects from religion, folklore, the natural sciences, militaria and fairy tales, among others. At the beginning of the 19th century, they were still being printed in runs of a few hundred, but with the introduction of lithography at mid-century, the print runs grew to tens of thousands in many cases. The prints were produced in factories where the work process was divided up and performed by various specialists: Illustrators, lithographers and colorists. The sheets were colored primarily by means of cardboard stencils and brushes. Large factories employed hundreds of colorists for this purpose, often including children. Sometimes coloring work was done as home labor, or contracted out to prisons.? 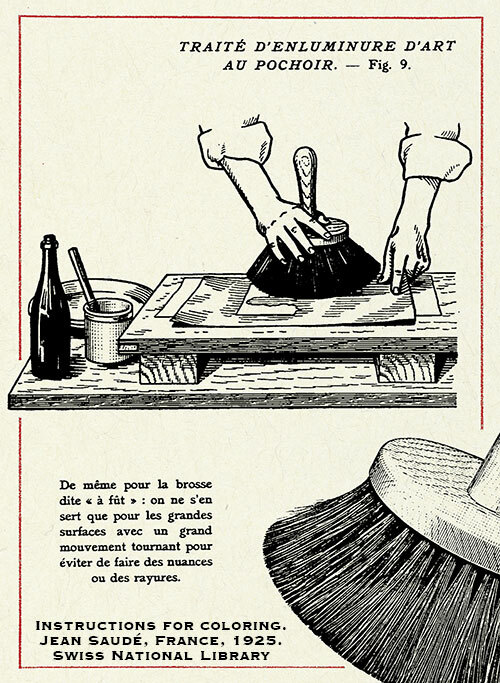 Between 1895 and 1935, open stencils were used in France to decorate books, magazines and art journals. Both the stencils and the finished prints were called pochoirs. The artisanal and artistic high point of this technique came during the Art Deco era. Artists worked together in ateliers specializing in pochoir work. Jean Saudé's atelier in Paris, perhaps the most important of them, perfected the technique.? Working from an original, the artist would first determine the number of stencils needed for duplication. The image - often just the outlines of the image - was then printed in a single color, in intaglio or lithography. Using these pre-printed images, the stencils could be positioned in exact register and the colors applied with soft brushes.? Thin zinc or copper plates were used as the stencil material, as well as impregnated cardboard or celluloid. Coloring was done with gouache ink, which would be applied in an opaque layer or as a glaze, depending on the design. Starting in the mid-19th century, patents were filed in the United States and Europe for methods of creating open stencils, the pieces of which were connected to one another by ties. In the decades before the turn of the 20th century, methods were patented that attempted to eliminate these ties, since they were nonprinting elements. The various methods proposed involved connecting the stencil sections with overlying bridges, wires or grids, or the use of a second stencil in order to avoid nonprinting areas. By the end of the 19th century, the main stencil carrier materials used in the US were wire grids and wire mesh. However, there as in Europe, woven fabrics like silk gauze were being used to an increasing extent. Silk gauze, or bolting cloth, was originally used for sifting flour, and was manufactured primarily in Switzerland and France. Patents filed by William Henay (USA, 1899 - an improved version of his 1897 patent), Antoine Vericel (USA, 1902), Hiram Deeks (USA, 1903), Jehan Raymond (France and England, 1906), Arthur Bostwick (USA, filed 1907, effective from 1914) and Samuel Simon (England, 1907) all mentioned silk gauze. This precision-woven gauze was available in various degrees of fineness and had good ink permeability, making it possible to produce perfect prints. Duplicating machines in which the printing form consisted of coarse-fibered stencil paper (the master) were used in office work well into the 1970s.? They made it possible to produce several thousand copies of texts or simple artwork with little technical effort. 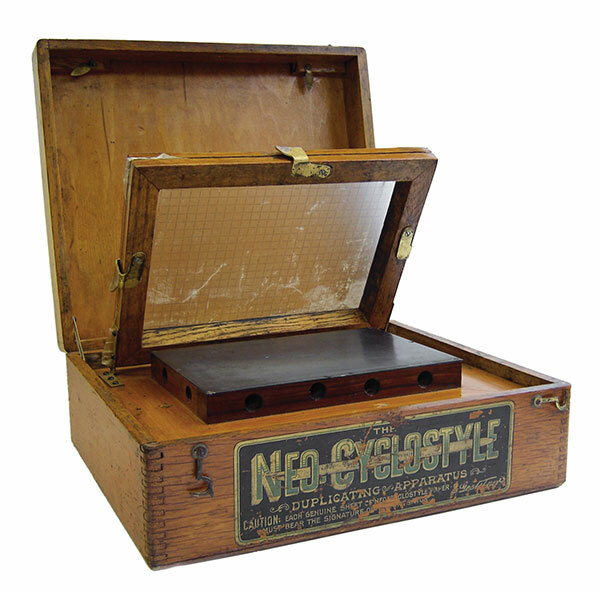 In 1887, Charles Nelson Jones, a professor of mathematics at the University of Michigan, got a patent for a stencil printer that took the technology one step further than Gestetner's Cyclostyle. In this device, the stencil frame was raised and lowered automatically by spring mechanisms. A foot pedal actuated the process, so the operator could concentrate on placing and removing the sheets of paper and working the roller. First the printing frame was covered with a silk or linen mesh, which acted as the base for the paper. The paper stuck to it during printing because of the adhesive power of the ink on the mesh. There is no record of whether Jones' printer was ever mass-produced and marketed. This version of the technology never caught on in the market. The stencil duplicators built from the 1890s on bore a remarkable resemblance to the first screen printing presses at the beginning of the 20th century. Both technologies involved devices with a flat plate and a stencil frame covered with silk gauze that could be opened and closed on a hinge. Elinor Noteboom even postulated a direct connection between Charles Nelson Jones' invention and the later development of the screen printing process.? However, no sources have yet been found to document this. The authors of journal articles and books during the early years of screen printing do not mention the stencil duplicators used in office work. Likewise, the developers and manufacturers of the duplicators never suggested that the adoption of their technology might have led to the development of the screen process. The duplicators evolved along separate lines from screen printing, eventually leading to the creation of offset duplicators and photocopiers.? We can, however, neither reject nor verify the possibility that their widespread use at the turn of the century may have provided some stimulus for the development of the screen process. "Twenty-five years ago a popular form of decorative souvenir was at its height. This was the college pennant and consisted of felt letters sewed upon a felt field of contrasting color. The vogue of the all-felt pennant gradually widened to other uses. Gradually souvenir merchants began to sell them bearing city names or commemorating special events and celebrations. 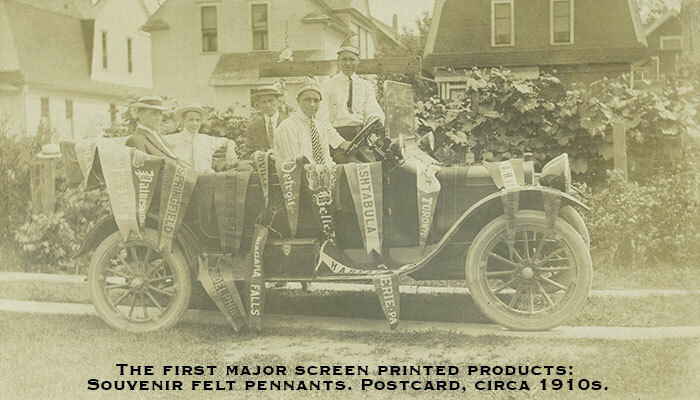 As automobiles increased in number, the custom of flaunting a pennant from the hometown also became prevalent. It was immediately following this era that advertisers saw possibilities in the pennant for advertising their wares, but the limitations of the all-felt sewed pennant for pictorial illustration and small lettering was far from adequate for their purpose. It was with open arms that the advertiser took a new type of pennant, which presently appeared. The 'innovation' was of the same general character as the college pennant, but in place of sewed letters it bore in paint colors a fairly representative illustration of a product and well-executed lettering, sufficiently small to enable an advertising text to be displayed on the felt field. The tieless stencil made this possible."? Before screen printing became the established method for printing on pennants, illustrations (quite unusual at the time) were applied by block printing, or automated letterpress for larger runs. The weakness in this process proved to be the thin color application: Single-color printing with black ink was the only way to get opaque prints on colored pennants. For multicolored illustrations, the outlines of the design had to be printed on white felt, and then colored in with airbrush using cutout stencils and transparent inks. If the customer desired, the decorated white felt piece could then be sewn onto colored felt to make a complete pennant. The screen process made it possible, for the first time, to print a complete colored pennant with opaque ink coverage in any color desired, thus eliminating the need to stitch pennant sections together or sew on letters - text and images both could now be printed in a single step. Often the design would be printed in white ink and then colored with airbrush, which was typical at that time. The change over to screen printing took place within a short time: Until the late 1900s, pennants were still mostly being made with sewn-on lettering, but then the screen printing process, which was more economical and provided better ink coverage, took hold. Manufacturers in New York and the Midwest led the way. Examples of pennants dating from 1908 exhibit high-quality screen printing work. After that time, only elaborately decorated pennants in small runs were still being made with sewn lettering. Graphic screen printing originated in California. The process was actually borrowed from the field of felt pennant printing and then adapted for printing signs, posters, displays, etc. The Pacific Printer & Publisher article mentions the most important figures involved in making the process a technological and commercial success. However, the collaboration among these parties also contained an element of competition, apparently even to the point of conspiracies. Three companies played a decisive role in the development of graphic screen printing: Velvetone and Selectasine in San Francisco, and Vitachrome in Los Angeles. The Velvetone Company, founded as a sign painting shop by Frank Otokar Brant in 1908, was first on the scene. Velvetone did its first screen printing jobs starting in 1912, and for decades it was among the leading graphic screen printing firms in America. Selectasine was founded in 1915 and Vitachrome followed one year later. During this early period, the three companies were connected in a variety of ways. The events can be reconstructed from four sources: Brant's autobiographical notes; the sometimes divergent reports from Selectasine's founders, Roy Beck and Edward Owens; and those of Charles Peter, a graphic artist who was a friend of Owens. Frank O. Brant and Joseph A. Garner were the founders of the Velvetone Poster Company in San Francisco, one of the most important pioneering companies in graphic screen printing. Brant was born in Kutná Hora, about 45 miles from Prague in the modern Czech Republic. He studied art and then emigrated to the USA in 1899, settling in San Francisco in 1906. Garner was born in San Jose, California, and worked as a sign painter. Brant acquired a sign shop in 1908, which Garner joined the following year; the two became business partners shortly thereafter, and company was renamed to Brant & Garner. Their friendship lasted for the rest of their lives. In the early years of the business, Brant was responsible for day-to-day operations while Garner handled most of the technical work. They printed their first screen process job in 1912. 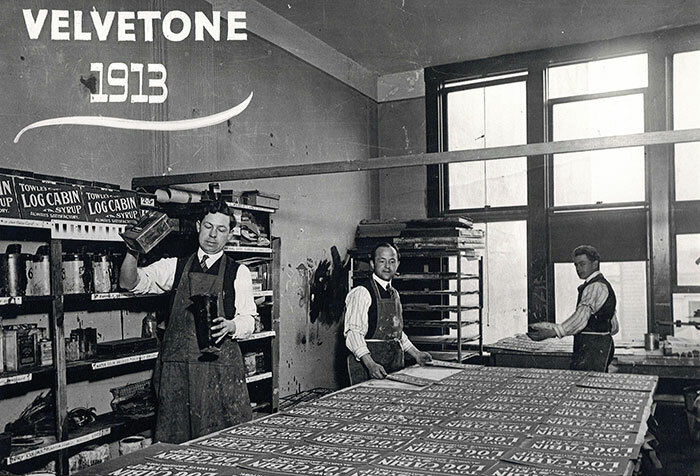 The company changed its name to the Velvetone Poster Company in 1918 after acquiring the Selectasine shop and achieved a national reputation for high-quality screen printing work in advertising and art. The firm experienced both prosperous and lean times. It was sold in the 1980s and liquidated in 1991. Garner died in 1966 in San Mateo, and Brant one year later in Oakland. Owens, Beck and Steinman founded the Selectasine Company in San Francisco in 1915, and filed a patent for multicolor printing from a single screen in the same year; it was granted in 1918. This revolutionary technique was developed by John Pilsworth and picked up by Selectasine without Pilsworth getting any benefit from the patent rights. Selectasine was the company that introduced the screen printing process in the graphics industry, and disseminated it by selling licensing rights in North America, Australia and Europe. Edward Owens was born in Portland, Oregon in 1885, the son of an Irish-born baker, and had three siblings. One brother worked in the newspaper industry as a photo engraver, and later as a photographer. Little is known of Owens' life. He worked at the Oregon Engraving Company as an "artist" around 1911. He first encountered the screen printing process in San Francisco in 1913 as an employee in a pennant printing factory. After Selectasine was founded, Owens worked tirelessly to refine the patented process, and he held additional patents for stencil making and printing machinery. He died in San Francisco in 1959. Roy Beck was born to Norwegian parents in Chicago in 1893. His father worked as a machinist in a printing plant, and Beck was trained as an electrician. This knowledge would prove useful for Selectasine, which was established to manufacture signs with screen printed lettering and electrical illumination. After World War I, Beck joined the printers Young & McCallister in Los Angeles, where he played a leading role in building their screen printing division, Vitachrome. Beck filed several patents on behalf of Selectasine, and later for Vitachrome, in the areas of printing technology and advertising. He was associated with Vitachrome as a member of the management board until his retirement. Beck died in Santa Clara in 1984. Jacob (Jack) Steinman was born in Sacramento in 1881, the son of a German immigrant. He started working as a "commercial salesman" in his youth, for which he had an exceptional talent, as even his competitor Frank O. Brant had to admit. He would later put this talent to use for Selectasine. Steinman lived in Oakland until at least 1923. In the following years, he left Selectasine and moved to Los Angeles, where he worked as a proofreader, mechanic and carpenter starting in 1926.? Steinman died in Los Angeles in 1933. Selectasine played the decisive role in spreading the screen printing process within the graphics industry by granting licensing rights for the technology it had patented in 1918. Selectasine's process represented an innovative complement to lithography, the dominant image printing process in the market at that time. Screen printing had some crucial benefits compared to lithography: It was more profitable for smaller runs but was also suitable for large formats. The process also permitted printing opaque colors on materials like cardboard, tin, wood, glass and textiles - materials that could not be used in lithography at all, or only with great difficulty. Why was Selectasine able to sell licensing rights for so long for a printing process that had been known since the early 20th century and described in technical literature? The key to its success came in the form of the comprehensive service package that the company offered. In addition to the basic licensing rights for the "single screen" process, the package included training by instructors, directions for making screens, formulas for the inks to be used, as well as the option to rent printing presses. In 1923, Selectasine produced a handbook that was provided to the licensees on loan.? It contained detailed instructions for various stencil and printing techniques, with corresponding printed samples, as well as for building printing equipment, along with information on the supply industry. Selectasine held the copyright on many of the instructions. All printed sheets had to be marked with the patent number. Starting in 1925, the licensees were periodically updated on the latest developments in the process through bulletins ("Service Features"). In 1924, Selectasine began developing the first automated printing presses with comparatively high speeds. However, according to the terms of the license agreement, the presses could only be rented, not purchased.? This bound the licensees even more tightly to Selectasine. The wrap-up in the next edition, April 15, 2014. Guido Lengwiler is a teacher of screen printing at the Schule fuer Gestaltung Bern und Biel, Switzerland (Bern and Biel School of Design). He was elected to the Academy of Screen and Digital Printing Technologies (ASDPT) in 2009 for his work on the History of Screen Printing. With support from the Academy of Screen and Digital Printing Technologies and industry, this valuable historical document was able to be produced in book form. Christoph Tobler, CEO of Sefar Holding AG, has been involved with the project for nearly a decade. He and his company have played a vital role in making this book a reality. The late Richard Eisenbeiss and his son R. David, president of the KIWO group (Kissel & Wolf) and the Ulano Corporation, have also provided their ardent support for many years. Eisenbess brought a binder with a working manuscript to the annual ASDPT luncheon in 2008, where members were so impressed with the research Guido had conducted, and the stunning photos he had collected, they began the long process of gathering sponsors in order to edit, translate, design and print the 496 page book in both its native German and in English. SGIA, Proell, Nazdar, M&R, Ryonet, Printcolor, Serico, Vitachrome Graphics, Grunig, Newman Roller Frames, Fimor, RH Solutions, Edition Domberger, and individual ASDPT members all contributed to publish the book. This article appeared in the SGIA Journal, September/October 2013 Issue and is reprinted with permission. Copyright 2013 Specialty Graphic Imaging Association (www.sgia.org). All Rights Reserved.